An ohmmeter is an electrical instrument that measures electrical resistance, the opposition to an electric current. Micro-ohmmeters (microhmmeter or microohmmeter) make low resistance measurements. Megohmmeters (aka megaohmmeter or in the case of a trademarked device Megger) measure large values of resistance. The unit of measurement for resistance is ohms (Ω). 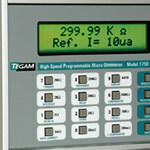 Once submitted, we will try and place you in contact with a suitable Ohmmeters supplier within 48 hours. Hioki 3540 Milli-ohmmeters from GMC Instrumentation Ltd.
DLRO10HD 10 Amp Digital Low Resistance from RS Components Ltd.
Model 2950 Hot Winding Ohmmeter from Ergonomics Inc.
Cropico DO4000/4001 Micro Ohmmeter from Keison International Ltd.